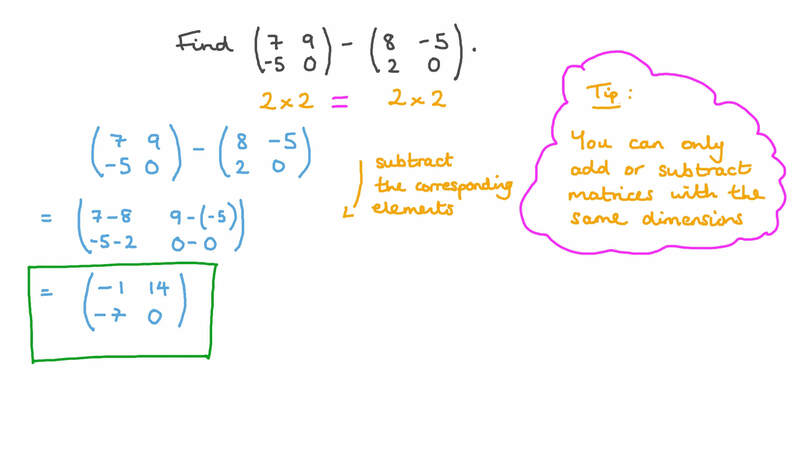 In this lesson, we will learn how to add and subtract matrices. Find  7 9 − 5 0  −  8 − 5 2 0  . Given that find the values of 𝑥 , 𝑦 , 𝑧 , 𝑎 , and 𝑏 . Suppose the sum 𝐴 + 𝐵 + 𝐶 makes sense. We also know that 𝐴 has 2 rows and 𝐶 has 3 columns. What can we say about matrix 𝐵 ? A 𝐵 is a 2 × 3 matrix. B 𝐵 is a 1 × 3 matrix. C 𝐵 is a 3 × 2 matrix. D 𝐵 is a 3 × 3 matrix. E 𝐵 is a 2 × 2 matrix. Given that 𝑂 is the zero matrix of order 2 × 3 , find the value of  2 6 4 4 3 − 8  + 𝑂 . Given that 𝑋 +  − 6 − 8 6 5  = 𝑂 , where 𝑂 is the 2 × 2 zero matrix, find the value of 𝑋 . Consider the following matrix. 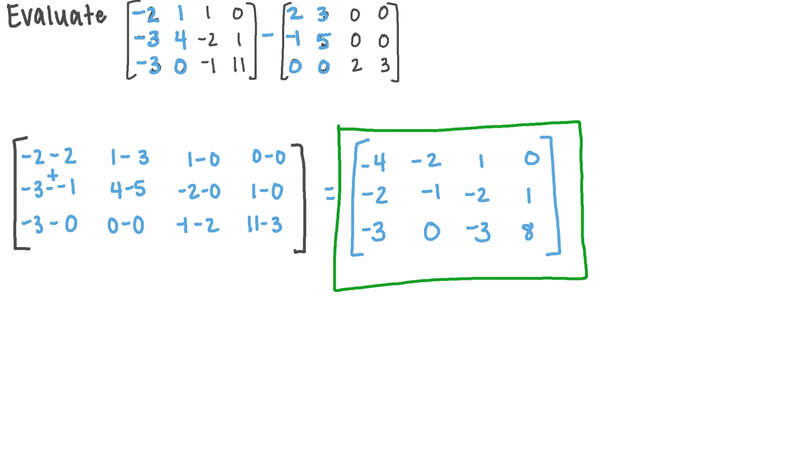 Suppose the sum of matrices and is as follows. Find the matrix . Let 𝑍 be a 2 × 3 matrix whose entries are all zero. If 𝐴 is any 2 × 3 matrix, which of following is equivalent to 𝐴 + 𝑍 ? Find  − 5 1 − 7 3  +  1 0 2 − 6 5  . Find  − 6 5 − 6 − 9  +  1 0 4 7 − 4  . Find  7 3 9 3  −  5 − 9 − 8 0  . Find  6 7 − 7 − 2  +  − 3 1 0 1 1 3  . Find  8 − 2 2 5  +  − 7 5 1 3  .